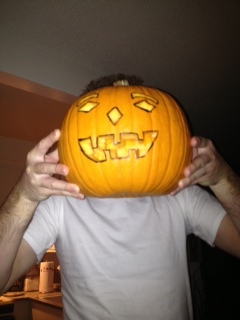 That’s right… Tonight, for the very first time in his 28 year life Mr. Than Veltman carved a jack-o-lantern. 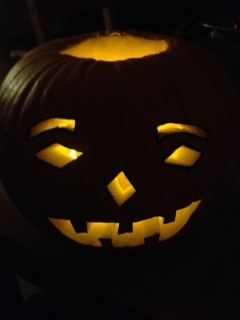 It all started Sunday afternoon when I was all googly eyed over the pumpkins at the grocery store. 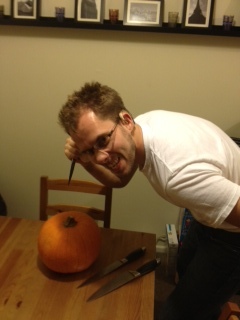 I suggested we carve pumpkins this week, when to my utter dismay Than proceeds to tell me he has never carved one. 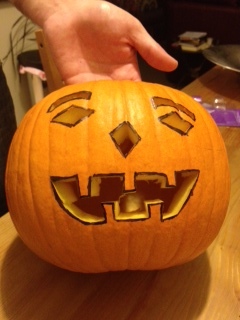 I rushed over to the pumpkin boxes and found the perfect little pumpkin for $2.99. What a bargain! 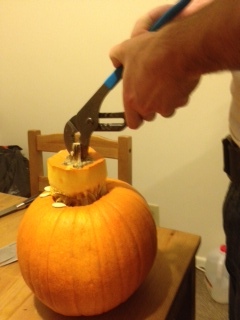 First time pumpkin carving with your hubby – priceless! 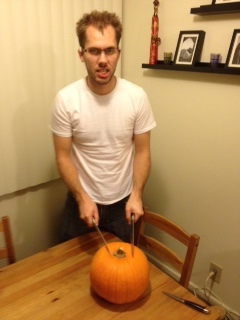 We brought out the big-boy knives for tonight’s adventure. Than was excited about that! In a former life, he was a chef at a hibachi grill (you know, where they play with the knives and throw broccoli in your mouth?) 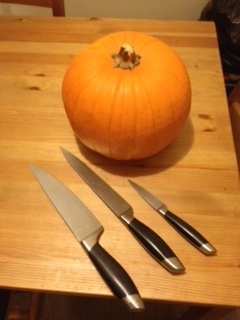 Look at those mad knife skills! The top was stuck so we had to bring in some extra tools. At last! 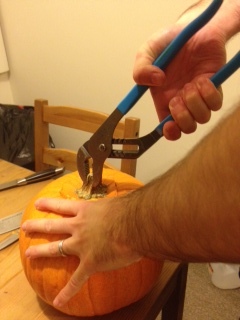 The top was loosed from the stubborn pumpkin guts! Now for the joy of removing the guts and goo! Ooooh!! It always looks so different lit up! 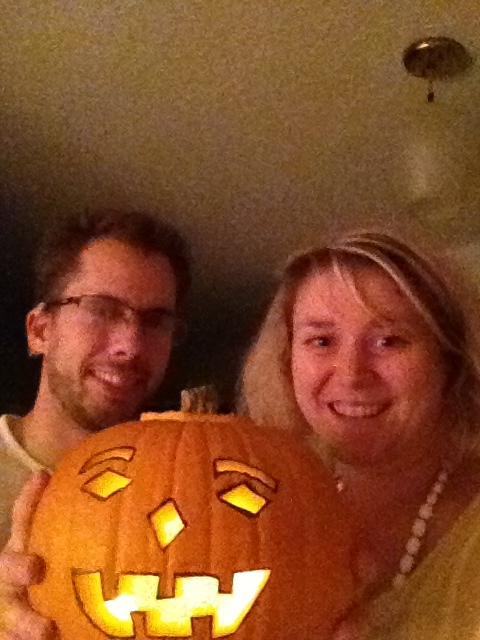 Our pumpkin baby – aren’t we a cute family?! 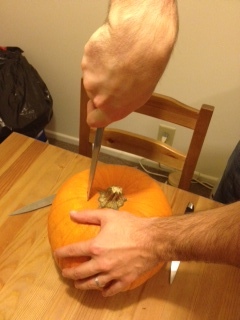 And lastly, I debunked the myth in which Than believed pumpkin seeds are poisonous and not fit for consumption. 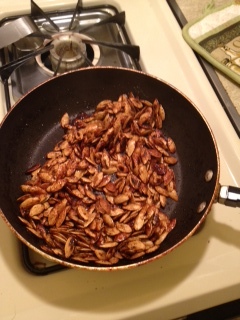 I’ve convinced him that they are not poisonous…yet he’s still not persuaded to consume them… Oh well! More for me! On BBC News one of my favorite things to look at is the Day in Photos – captivating shots from around the world. Feeling inspired, today I offer you Than and Ru’s Week in Photos – a few interesting tidbits from our past week! Spinach, frozen fruit and water – a great start to the day (as long as you can get past the fact that you’re drinking something that looks like guacamole or snot). 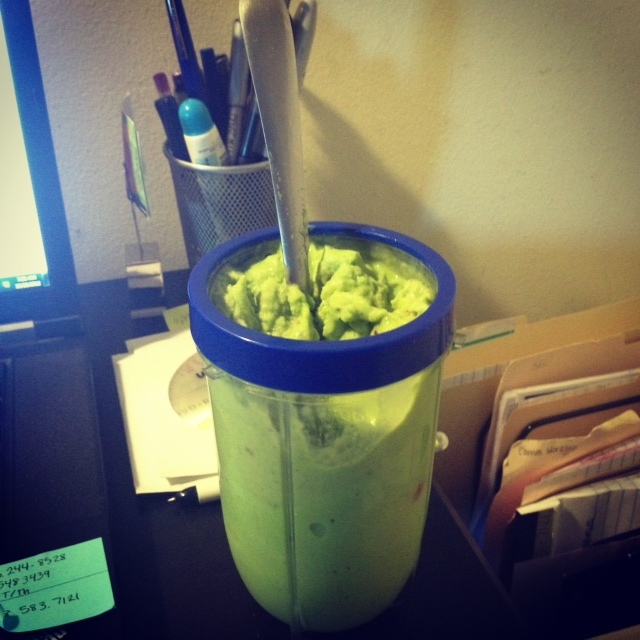 And definitely a good way to get some extra fruit and veggies in! And thanks to Pinterest – a fantastic way to save your spinach that’s about to go bad! 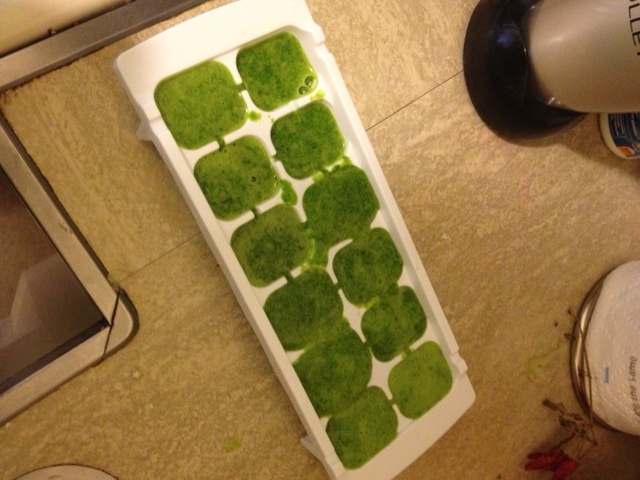 Puree it and freeze it in an ice cube tray and drop one in your smoothie! So smart! 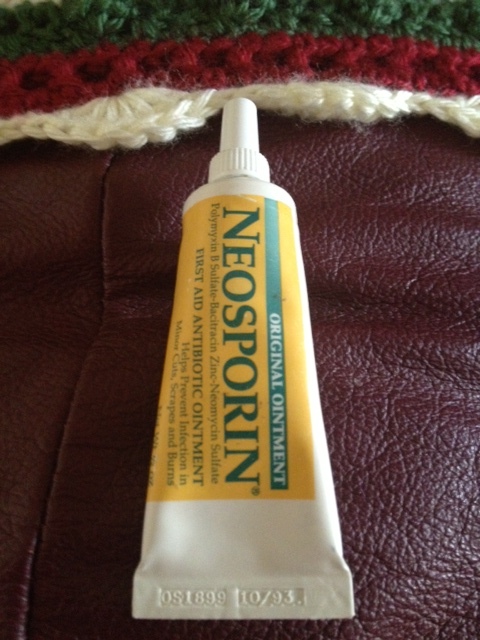 Shameful Moment of the Week: Look at the expiration date.. Closely… Oops. Than and I were in what – Grade 2 and 3 maybe?! Pretty sure I had poofy bangs in 1993! Trying New Things: Each week I am trying to buy something out of the ordinary at the grocery store. This week – parsnips! 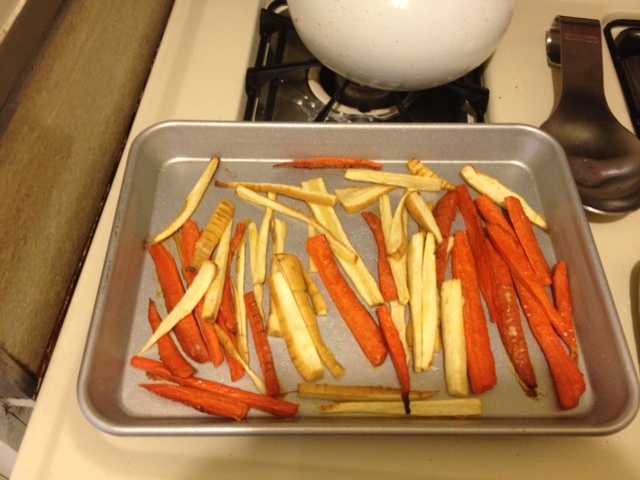 I cut some carrots and the parsnips like french fries and baked with olive oil and some salt – yum. 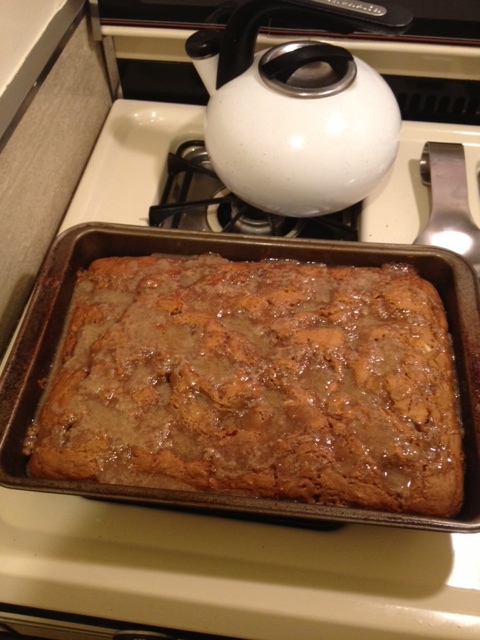 Pumpkin Obsession: My obsession with pumpkin continues and I can’t wait to try this pumpkin coffee cake that just came out of the oven! I’m not really into celebrating Halloween but love all things fall! 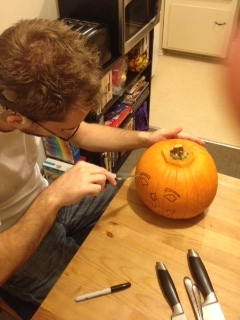 Therefore we celebrate with pumpkin! 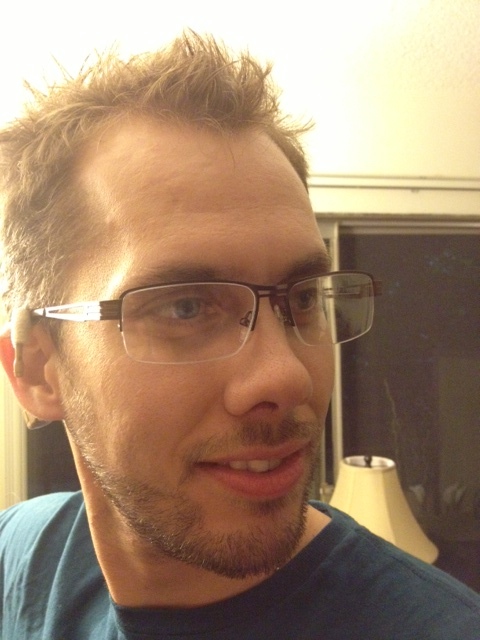 And last, but certainly not least – Than got new glasses! I’m totally envious. I want glasses!! Aren’t they handsome?! This weekend our church service was focused on disabilities. People with disabilities who attend Lake participated in the service by leading congregations prayers, reading Scripture and special music. They also brought in the in the Barrick family to share their story. In my experience it’s not often that churches highlight people with disabilities (beyond announcements in the bulletin looking for volunteers for the classes they offer for those with disabilities). I am confident every person worshiping last night could comment on what a moving service it was. No doubt the words I use here will not be able to even begin to capture the sweet spirit of worship in last night’s service. As a young lady sang “I Can Only Imagine” there was barely a dry eye in the place. While overcome with a bit of stage fright she persevered and sang her heart out. She sang with incredible passion and with absolutely no reservations. She danced for joy. She fell to her knees in worship. What an incredible blessing she was in sharing her talent to lead us in worship! I won’t try and capture the Barrick’s story here on this blog (see link above or check out their book Miracle for Jen) but I do want to share what resonated most with me from their powerful testimony. The family was hit head-on by a drunk driver going 80 miles per hour. They all sustained significant injuries and their daughter Jen with the most life-threatening. She wasn’t expected to make it through the night. God spared her life and through the healing process (she still lives with a brain injury), while Jen was unable to respond to verbal commands or to communicate with family or friends, she was consistently communicating verbally in prayer with God. She was engaged in conversation with Him, her prayers consumed not with pleading but with PRAISE! So much of their story just blows my mind, but the thing that resonated with me the most is how while Jen had to re-learn everything from swallowing, to brushing her teeth, to walking, reading and writing…. She still remembered Scripture she had hidden away in her heart and songs of praise! It’s amazing to see how the treasured words from God’s Word never left her heart. When we meditate on and memorize God’s Word, we aren’t just filing it away like other facts in our brains. No… The Word of God transforms our hearts and permeates to the very deepest part of our being. And like in Jen, God will bring those treasured words to the surface when we need them the most. 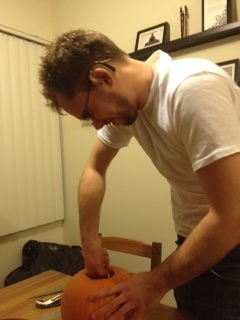 Our life here in Apartment 8 is developing into more and more of a routine. We’ve plugged into a great church, attending the Saturday night service, taking a Financial Stewardship class and volunteering at Alpha. Than is 4 weeks into his classes and I am becoming an expert proof reader of his seminary papers. Who knew I’d learn so much about theology with a husband in seminary! I’m enjoying getting to know other “Fuller wives” at my Thursday night Bible study and of course, I continue to have some Pinterest wins and fails! I love the fact that I have a bit more time to use at my discretion since our move. It’s amazing what cutting a commute out of your life will do! I have time to read, blog, cook, watch TV, remind myself over and over again how un-crafty I am with attempts to be creative…and attempting to grow some herbs! 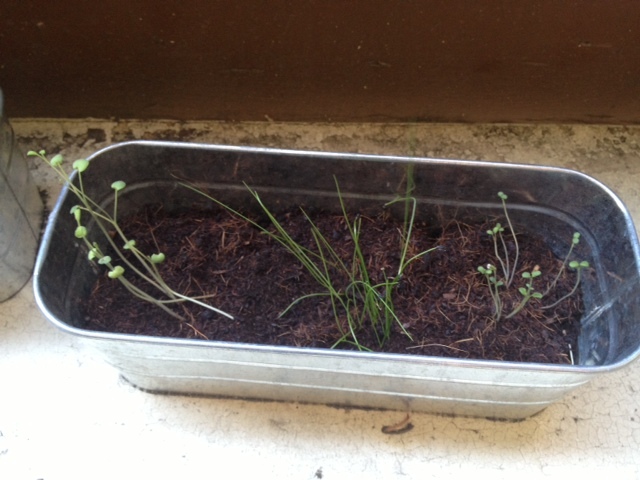 That’s right – we’re growing some herbs. Slowly but surely. I don’t have much of a green thumb but I feel very good about trying! 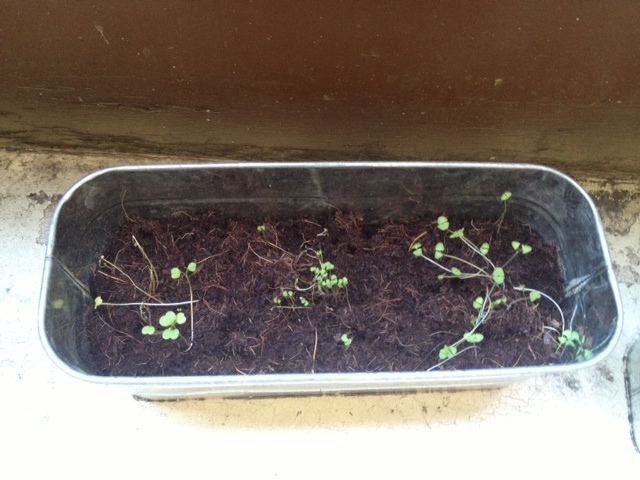 If only I had put little labels in to remember which seeds I put in each part of the planter… Oops! Oh well – we like surprises. Or we’ll put that Google Goggle app to good use! Thank goodness Than remembers to water them on occasion or they’d be brown as could be! Than recently accept a job at Lake Avenue Church! He will be serving as their Coordinator for Community Outreach Ministries. It is a part time job (20 hours a week) and he starts this Friday. A significant part of his job is working with their homeless program, but he will also be working with other outreach programs assist with thinking through and implementing a new strategy for engaging the local community. This week at Bible study we were studying Hannah’s prayer from 1 Samuel 2. In the middle of her prayer are these “prayers of reversal”. Prayers for the hungry to be hungry no more, prayers for the barren to bare children, from poverty to wealth…and so on. It got me thinking – what “impossibilities” am I praying for? Too often I find my prayer list full of common things. Please don’t get me wrong, we should certainly pray about the “common” things (Scripture is clear that we are to bring all things to Him) but I want my prayer life to be full of God sized prayers. Prayer for the impossible. Bold prayers for reversal. Sometimes I struggle to even think of what big things I should and could be praying for. Needs are so prevalent I find myself becoming desensitized. From the seemingly impossible situations of poverty in Africa (and many more places), to human trafficking in Southeast Asia (and beyond…), or homelessness in our community or even the impossibilities in your very own home and life – the list goes on and on. What’s on your heart is different from what’s on mine and we need to pray boldly for impossible things. Do not be discouraged when it seems like God isn’t answering. Be persistent. Remember Hannah. Praying for a child. Pleading with the Lord. Waiting. Seeing her prayers answered. Lord, give us the imagination and courage to pray for the kind of reversals that honor You. Than and I started a new prayer list with this fabulous idea from Pinterest! Find an old picture frame. 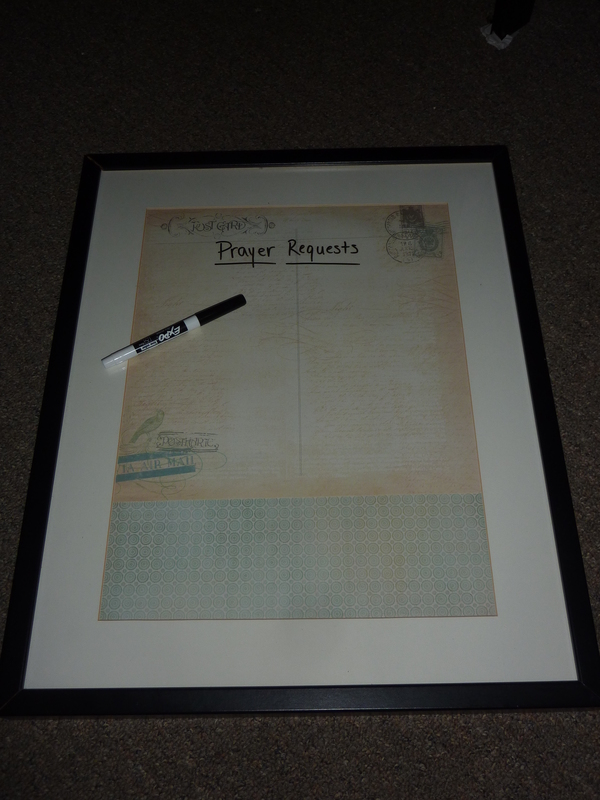 Use a dry-erase marker for an easy to update prayer list for your family! 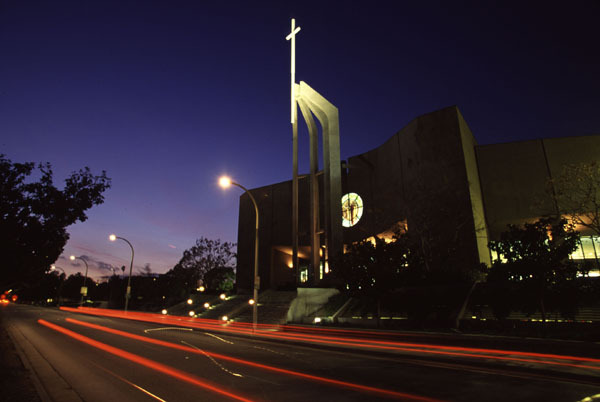 On Wednesday mornings Than and I go to Fuller’s all campus chapel service. This week the speaker was talking about storytelling. “Thank God for Storytellers” to be more specific. He was focused more on those called to be teachers, but the whole concept of storytelling has inspired me! I want to be a good story teller (and that desire makes me feel very good about being a Communications major – you know the degree you can do anything or nothing with..!). Stories engage us. Stories connect us to others. Some stories inspire, while others educate and some amuse. No doubt cultures all throughout history love a good story. We see it from the beginning of time through present day. We see it all over 2012 via mini stories on Facebook statuses and 140 character tweets. Ordinary facts and observations can explode into vibrant, and memorable tales with the right story teller. While storytelling has taken on many forms through history, no doubt storytelling is timeless. I love a good story. I love the kind of days where by the end of the day I’m bursting with stories to tell. I love stories about travel. I love stories about the funny things that kids say. Stories about where people come from and where they dream of going. Everyone wants a chance to share their story. And then it hit me. Perhaps I shouldn’t focus so much on telling a story as I should focusing on listening to stories shouting to be heard. On Sunday nights, we’re volunteering at (Ru) and attending (Than) the Alpha course at our church. So many new faces to get to know…so many stories to be heard. The actress. The homeless woman. A fellow Chicagoan. Unlikely friendships are being built as stories are shared. Bonds are built and trust is established. People share in the joys and share in the sorrow. I kid you not, that’s what my husband said in his prayer before dinner one night (among other things)! I was laughing too hard once I heard that to tell you what else he said. 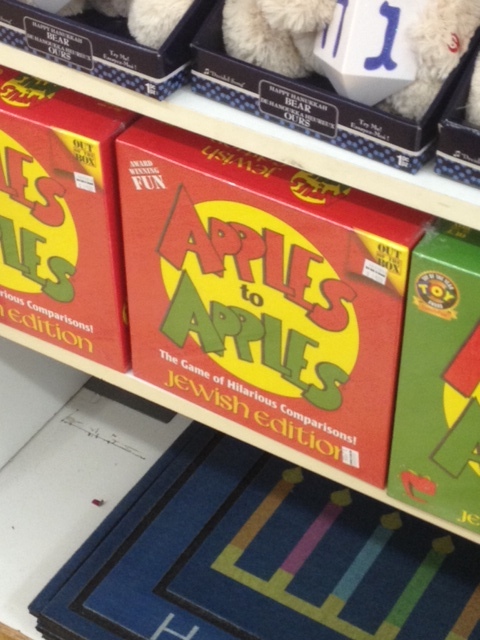 I too am thankful for his “accepting palate”. He’ll pretty much eat anything I put in front of him (except tomato soup) and is adventurous in his eating habits, and dare I even say appreciates my creativity! Cooking for two is certainly different than living the single life where I could eat popcorn and broccoli for dinner if I liked (and often did). 1. If you’re like me and enjoy being creative in the kitchen, be sure to plan a “normal” meal on the preceding and following nights. 2. Do not, I repeat DO NOT try new recipes when guests are coming over. 4. Sometimes it’s best to keep secret ingredients…well, exactly that, a secret! Your husband might think it’s weird that you put potato chips in shortbread cookies or mayo in chocolate cake. 5. Not all ideas on the internet or Pinterest can be trusted. 6. Be careful not to make too much of one thing because with two people in the house you will get tired of the leftovers VERY quickly. 7. Often you can hide an ingredient your significant other claims not to like in a recipe without him knowing it. Hehe. 8. Cooking is actually quite fun – who knew?! 9. When you have a recipe disaster, be sure to make something you know is good the next night to get your confidence back up. 10. When your husband includes thankfulness for an “accepting palate” in his prayers, know that something in that particular meal must look a little scary to him! Stop Drop and Roll… I Mean Drop, Cover and Hold On! It seems like in the Midwest, come January or February all people are talking about is the “big one” coming. A big blizzard that’s sure to shut down the world for a couple of days. Well in California those conversations are adapted slightly. The “big one” refers to that earthquake that’s going to knock LA out into the ocean! Or so they say. So they say…a LOT! People here definitely like to talk about coming earthquakes. Apparently right now conditions are right for an earthquake. Something about the soil. I promise I’m not making this up – that’s what they tell me. I’m getting quite the education about earthquakes. They put out brochures here such as “Putting Down Roots in Earthquake Country” – just some pamphlets to scare Midwestern folk half to death. Before I read these brochures I thought that the shaking I sometimes feel was from the freeway. Little did I know, these are potentially little earthquakes. Coming home to picture frames fallen from the shelf on the wall….earthquake? Slammed door? Who knows! But do not fear, I’ve learned what to do in an earthquake. Similar to what they teach you in elementary school about what to do in a fire (Stop, Drop, and Roll) in an earthquake you are to drop, cover and hold on! When I was a kid I wanted to be a meteorologist. Terrified of storms, when the dark clouds started rolling in I’d run around the house putting together a “survival kit.” Living out in the country, we had a well so I’d put myself to work filling up pitchers of water in the case the power went out. Pillows and blankets were thrown in the bathtub, while a backpack was filled with flashlights, candles and whatever else proved to have a potential use. Believe it or not, we don’t yet have an earthquake survival kit, but it is on my to-do list. One for our home and one for the car! My words of wisdom for you today: Drop, Cover and Hold On!